Creating history once again, COLORS is back with the second edition of Rising Star, India’s first LIVE singing reality show. This year the show embarks on a journey to find India’s next musical sensation whilst breaking barriers of emotions, sentiments and prejudiced through processes. Armed with its top notch expert panel comprising of actor-singer Diljit Dosanjh, veteran singer Shankar Mahadevan and the melody queen Monali Thakur, this season is being hosted by Ravi Dubey and Parth Dhamija. With the second season, Rising Star has raised the bar a notch higher and is giving everybody a chance to lift ‘Soch Ki Deewar’ and rise as the brightest star showcasing their pure talent. With a new season of Rising Star, there is a new surprise for all the contestants called the ‘Tutari’ moment. This is a traditional tune, usually played during celebrations and functions, to mark a joyous occasion. 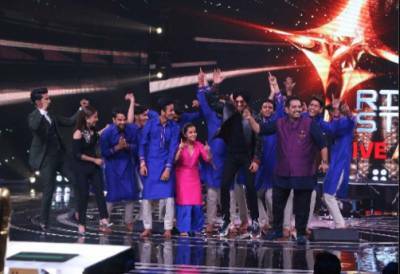 So, everytime there is a spectacular performance by any of the contestants, the experts honour the talent with the Tutari moment.Rising Star season 2 has already showered 3 contestants with this moment for their outstanding performance. Soham - Chaitanya, Ashwin and the Afreen group were the proud honorees of this recognition. It not only encourages contestants to raise the bars with their performances, but also adds on to the fun quotient of the show where all the expert dance together. Rising Star season 2 aims to inspire everyone to think beyond the norm and lift the ‘Soch ki Deewar’.and keep watching Rising Star season 2 every Saturday and Sunday at 9.00 PM only on COLORS!